Just gets hilarious-er and hilarious-er. 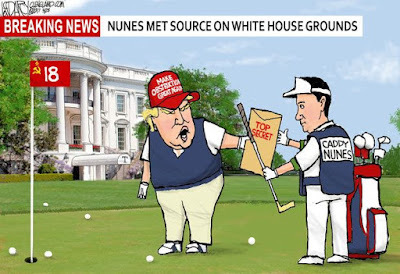 The cartoon makes perfect (if bizarre) sense. Trump is notorious for masquerading as his own press agent to plant stories about himself. Jeez! "NCAA Should Tell NC to Pound Sand"
Has Anyone Seen the Watauga Republican Party? "Ginny, We'll Make Your Town Hall Fun!"